If you’re like me, you love to decorate your home but you’re constrained by a budget. For 10 years I was a single mom but I figured out how to buy my own home and decorate it without spending a lot of money. After re-marrying, I had more money to spend but found I wasn’t comfortable paying a lot of money for things I’d previously scrimped on. 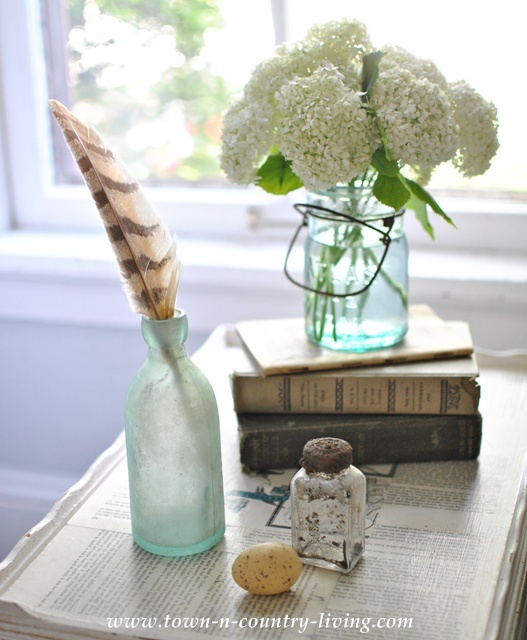 So I continue to incorporate simple decorating ideas on a budget in my home. 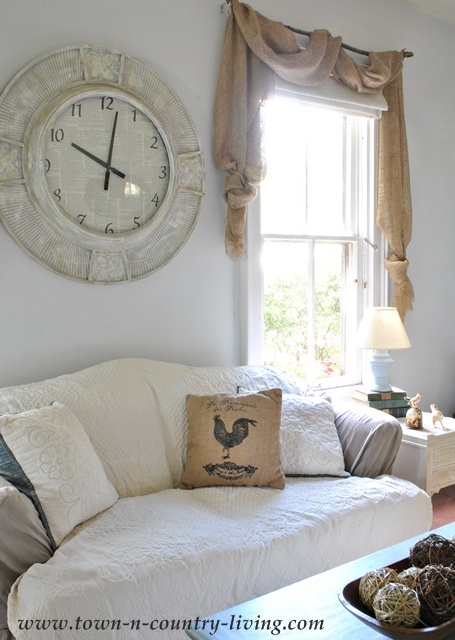 Today I’d love to share budget-friendly decor from my family room. 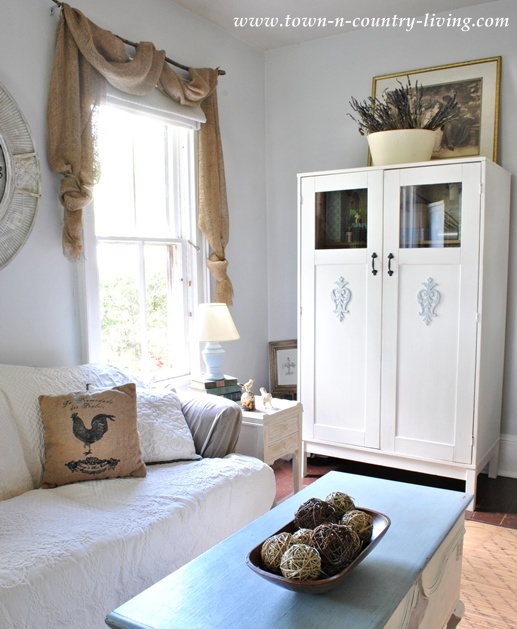 In my family room, I’ve taken a variety of hand-me-downs, flea market finds, clearance items, and garage sale pieces and unified them with white paint. This room only has 2 pieces of furnishings that were purchased brand new and at full price from a store … the IKEA cabinet in the right corner (which I painted white to match everything else) and the bamboo script mat on the floor. The IKEA cabinet houses crafting supplies but was initially used as my computer cabinet. It came in pieces in a box and I assembled it all by myself! It was the biggest splurge in the room at around $300. I later painted the IKEA cabinet in Pure White using Annie Sloan Chalk Paint and added the decorative appliques to the door fronts. 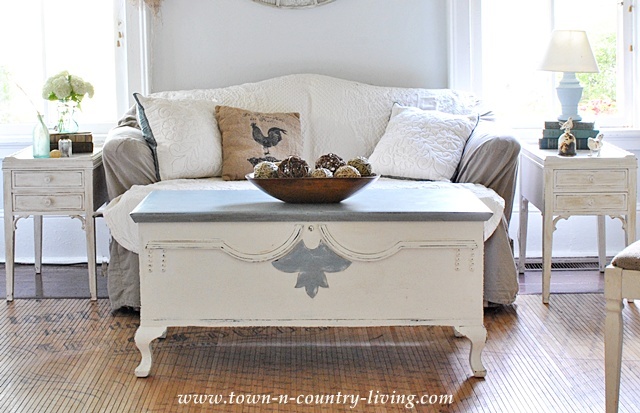 The coffee table is a vintage blanket chest belonging to my husband’s aunt. It was dark and dingy-looking so I painted it Pure White and added Louis Blue on the top. I love the curtains in this room! Look closely and you’ll see that the curtain rods are branches I found out in the yard. I used landscape burlap (which is softer than regular burlap so it drapes better) to create a swag. I didn’t want to do any sewing so I knotted the ends. I purposely left the ends at different lengths so it wouldn’t look too symmetrical. Cost of the landscape burlap for 3 windows was $30. The white Roman shades were purchased from IKEA for about $4 apiece and they work great! Ready for more simple decorating ideas on a budget? The big clock was a find at The Little Traveler … on sale for less than half off. I can’t remember what I paid but it wasn’t more than $60. I ended up painting it because the color was too dark for this room but I liked its size. The face of the clock was too yellow so I removed the cover and used Mod Podge to attach book pages to the face. Then I simply stenciled on the numbers and put the clock back together. Easy peasy! The love seat was purchased when I wasn’t sure what I wanted to do in this room so I didn’t spend a lot of money on furniture (I have since figured out what I’m going to do and will be replacing some of the furniture). I found this love seat at a garage sale and bought a slip cover online from Sure Fit. It looked a little plain to me, so I layered on a creamy matelasse coverlet I had on hand and added a couple pillows on sale from Home Goods. The rooster pillow was a Christmas gift from Barb at The Everyday Home. Now for more simple decorating ideas on a budget that extend to a few of the finer details. The books were all purchased for just a couple dollars apiece. 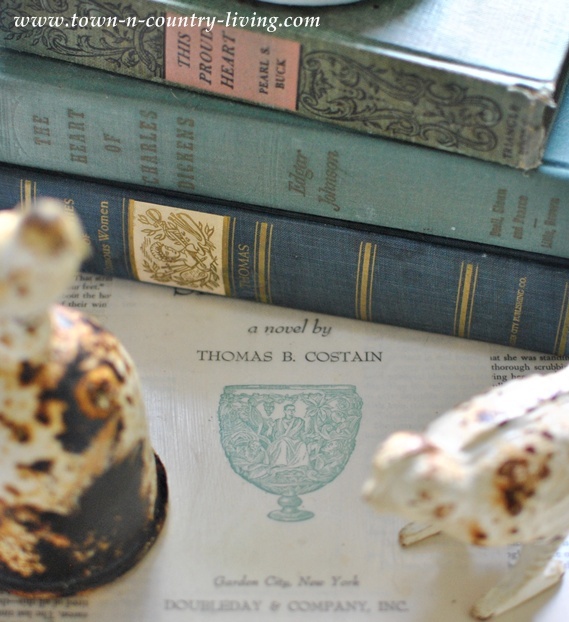 I love using vintage books throughout my house for simple decorating. I typically group them by color. 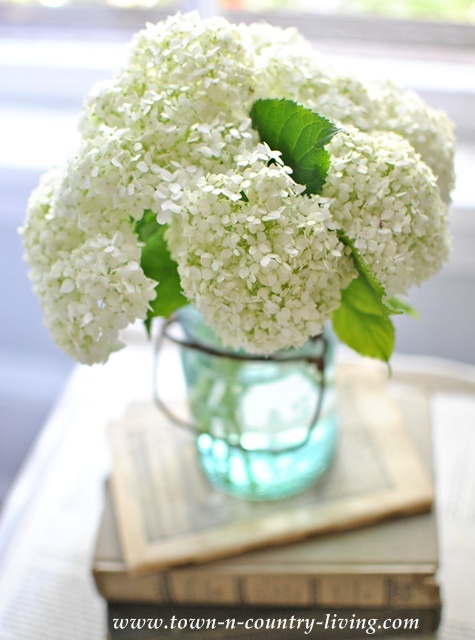 The blue Atlas jar was a steal at $2 from the flea market, and the hydrangeas were free from my backyard. 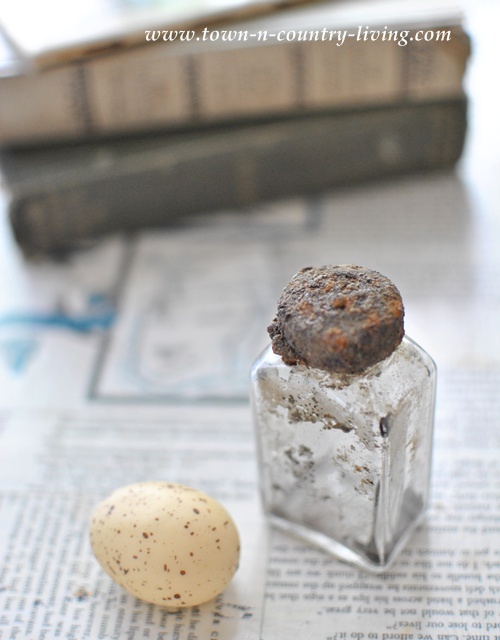 This crusty yet adorable little bottle is one of my favorites and it was found in the same farmer’s dump. 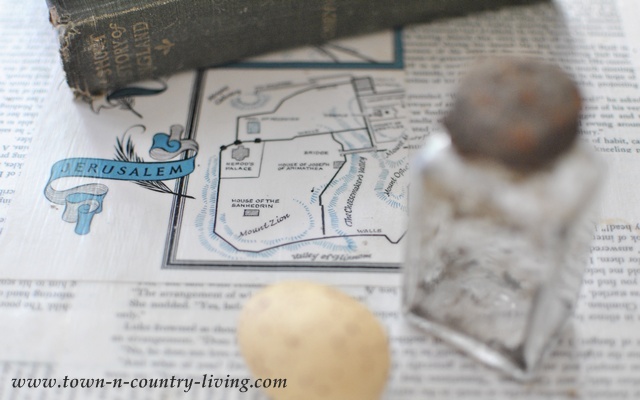 You can see the tops of my end tables are decoupaged with old book pages using Mod Podge. These pages are from The Silver Chalice, which is a story that I love. I used this book because the pages had bits of blue in them that matched the rest of the room. 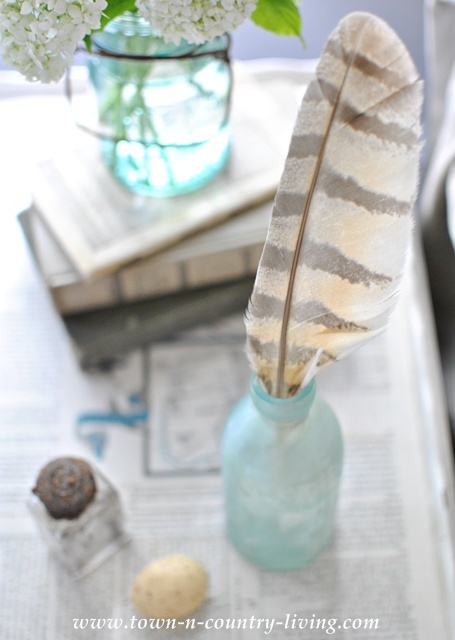 Another simple decorating idea on a budget that adds a bit of whimsy. The other end table houses more books and a pair of white, rusty cast iron birds that were inexpensive yet pretty. I keep moving them from room to room. 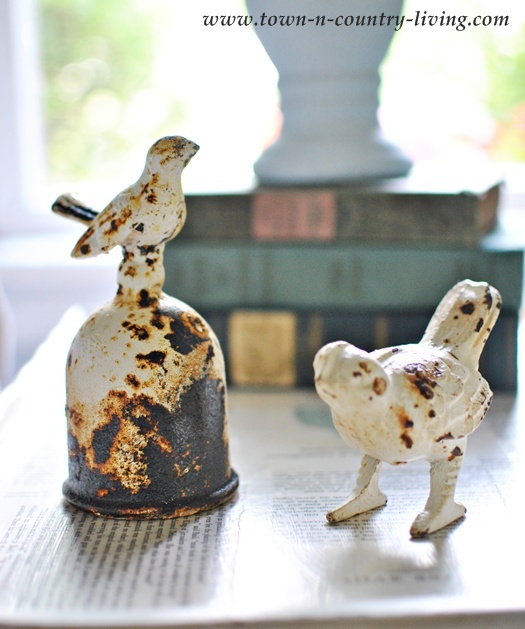 Do you do that with treasured pieces in your home? Here you can see the cover page from The Silver Chalice that’s decoupaged onto the top of this table. The top book on the stack in the background is by Pearl S. Buck, one of my favorite authors. I’ll never use those pages for a craft project! 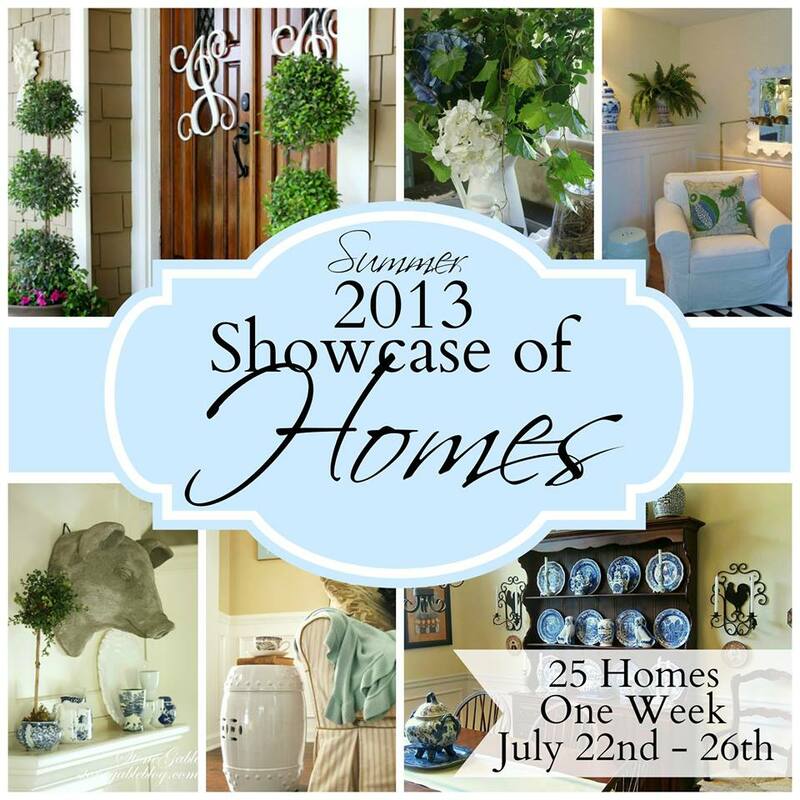 Coming later this month is a Summer Showcase of Homes for you to enjoy. 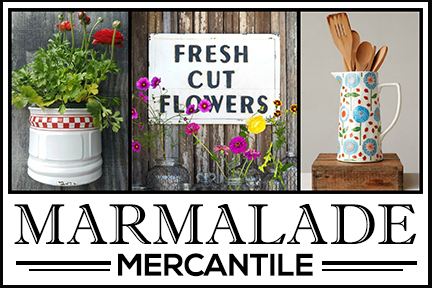 From July 22nd – 26th, 25 bloggers will open up their homes for a summer tour. That’s 5 homes each day! My home will be on display Wednesday, July 24th. On the last day, we’re hosting a linky party for others to link up a tour of their own home – all decked out for summer! Be sure to come back for the home tour later this month! I always enjoy seeing your home Jennifer. This room has a lovely welcoming ambiance about it and I adore the clock you made over too. 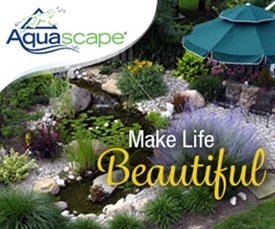 You have done an amazing job decorating your beautiful home on a budget!Love your bulap curtains! I just love all of your decorating ideas – I love white too! You are very creative and talented. Thank you so much for sharing. Everything is so soft and beautiful… you are amazing! 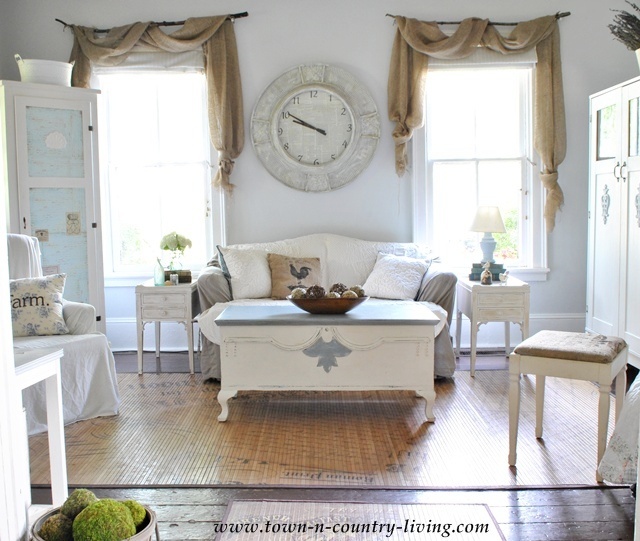 I’m so drawn to the all white, you would think I’d do it but just haven’t got the guts too:) Love your family room and your coffee table that you painted, also the the clock was a great idea too! You are so talented. Have you ever thought of doing this for a living? You’re so creative. I wish I lived nearby, I’d love to see your home on tour. You’ve done a lovely job on a budget, Jennifer! I think you get a more comfortable welcoming feeling from homes that are put together with creativity from stretching your dollars. You may have to rework certain things to fit in, like your clock, but you get to add your personality that way. LOVE this room, it’s so cozy and comfortable. The clock and end tables with the book pages are wonderful!! I think this is my favorite blog post anywhere ever. I’m constantly inspired that you decorate one of the most beautiful homes I’ve ever seen using your imagination and effort instead of cash, and I think it makes it so uniquely yours. The details seem like easy projects when you describe them, but it’s the vision behind the entire room that takes such talent and creativity. I’m really bowled over by this post. All good ideas. I love how white paint unifies a space! Your home is so lovely! And your creativity is boundless. I love every single thing! We don’t have an IKEA in the entire state of OK. Oh, I so wish we did. 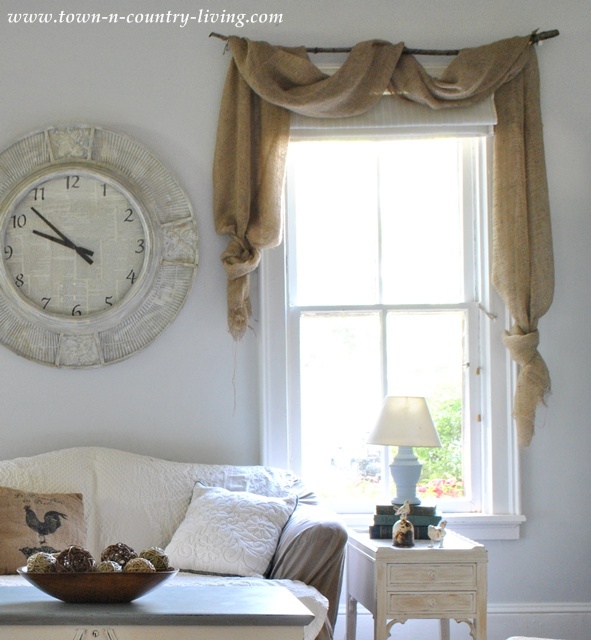 I adore the “budget” looks you’ve achieved in your family room- the window treatments, clock and coffee table add the perfect element of whimsy that can’t be bought! 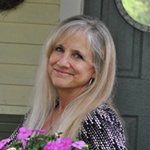 Lovely looking through your blog! Your home is lovely. Your shopping is my kind of shopping and especially right now. I am scouring the thrift stores and yard sales for Christmas of all things. 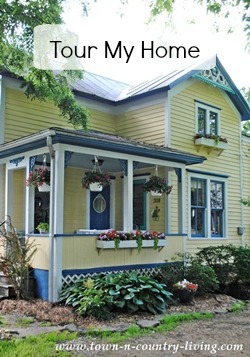 You have such a beautiful home, and I love all of your thrifty finds! Thanks for sharing your tips with us! Beautiful room. Shows you don’t have to spend big to be creative, and have a lovely space. I absolutely love the simplicity of this room. I’m in the process of moving out and would like to do something like this with my living room. This post inspired me to stay clean and simple! Thanks for sharing. I love it! You burlap curtains are my favorite! I really love this living room! The white couch is so cute! I have one also, and needed some color so I just got a new throw blanket and it worked. So cute. Love the decorations too! What width burlap did you use for the burlap swag? Same, width of burlap and how did you put the sticks to wall? Clever idea!!! What is the color of the paint on your walls?